The weekend is nearly here, and T-Mobile is celebrating by kicking off a couple of new iPhone deals. 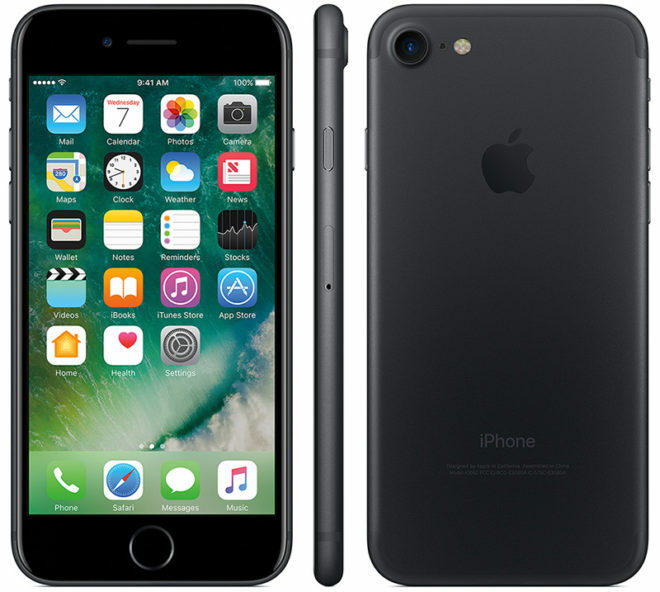 First up, you can now get a 256GB iPhone 7 for the price of the 128GB model. That means that you can get a 256GB iPhone 7 for $125.99 down and $26 per month for 24 months, which works out to be $749 total, $100 off the 256GB model’s normal price. The other deal that T-Mo is launching today is for the iPhone SE. If you buy a new iPhone from T-Mobile, you can get a iPhone SE for free after $400 prepaid MasterCard card. This applies to all of the new iPhone models that T-Mobile offers, including the iPhone 7, iPhone 7 Plus, iPhone 6s, iPhone 6s Plus, and iPhone SE. To get your free iPhone SE, you’ll need to purchase a new iPhone and iPhone SE on EIP, then go to the T-Mobile Promotions Center page and enter the promo code 17Q2SEONUS. T-Mobile will then send a $400 prepaid card your way. These limited time deals are now available. Add a new line only. The rep I talked to just clarified this for me. As I just upgraded and she said you have to add a new line. To get the $400 card I mean. Are you talking about the SE deal or the 7 deal? I just logged in to my account and went to the equipment area to upgrade a line, and the pricing for the 256gb is the same as the 128gb. No I was referring to the free iPhone SE. Enough with the rebate cards. That is SO carrier. If youre going to give something for free on a BOGO, dont make people lay out hundreds in cash or an EIP and then try to get it back. Just end this once and for all and make the customer experience better. Get over it. There’s a calculated number who won’t submit, even at $400. It makes the deals better for those who do. So you keep a clunky non customer oriented policy because you know there are a few challenged people who won’t submit it? Instead of helping them not get cheated and get what they have been promised? That sounds EXACTLY like a Carrier line of thinking. Take advantage of customers and inconvenience everyone to save some bucks. It’s as high as 15%. That’s $60 in real money. You do the math. The difference between you and me is I understand that T-Mobile, like all corporations is entitled to make a profit. They can run great promotions for less of a hit to their bottom line by having mail in rebates. One day when you move out of your parents’ basement you may understand basic economics…and NO, business IS ABSOLUTELY NOT suddenly going customer friendly. Customer loyalty is meaningless when you lose money on every customer. T-Mobile used to do that. Hasn’t been that way in a long time though. I would jump Android ship for a 7” version. With Apple bezels that phone would be too big to hold. Hmmm….I just bought a 128GB iPhone 7 Plus last Friday, but it looks like the deal doesn’t apply to the plus model. Deal is still going on according to the Doc we have in the retail store. I work in a store, the promo for 2 for $100 is still here, but if you want to take advantage of the new 2 for 1 add a line promo then you need to switch to the $120 plan. Yeah, they took it off their website when adding the 2 for 1 promo, but then shortly after fixed it and posted it back as 2/100. Editing the post now. I love the iPhone SE outside of the 640p display and a few bugs. Great software and hardware experience overall. I paid $185 for mine. It’s $150 for the Simple Mobile 16gb one and $199 for the 32gb model from AT&T. AT&T had free unlocks for a bit, but they closed it off after I bought mine and had it unlocked through them. Boost Mobile has them for cheap too. T-Mobile’s $400 asking price is too much though. You might as well spend half the price for a Moto G5 Plus or go spend $30 more to get a OnePlus 3T before it gets discontinued. T-Mobile’s price is not too much. You are buying the phone outright through installment or what not. With Sprint, AT&T its tired to a contract where the difference is coming from. I stand corrected but Apple iPhone SE is not $150. or $199. I got my phone outright for $185. AT&T GoPhone ones are $199 and could be used on their postpaid accounts. Simple Mobile is $160. I’ll share the links for those who want to buy one and unlock to avoid paying full MSRP for the device. I just got off the phone with customer service and sure enough its just for the IPhone 7 not the Plus. Still it’s a good deal. But I was really hoping they would have the same deal for the plus. Maybe next month they will have the same deal for the plus if not sooner If this was the plan to move out the iPhone 7’s to make more for the 8 or the 7S or 7S Plus than they should have the same deal on both sizes. But then again they might be losing money on the Plus deal. I’ve been using Android and IOS for years and I’m ready for a change again. iNorder to get the free iPhone SE you have to buy an eligible iphone using the EiP (24 month) payment plan and add a line for that iphone and also the “FREE” iPhone SE has to be on an (24 month) EiP Plan with an added new line too. Your $400 payoff will be sent to you in approximately 8 weeks granted that your account stays in good standing. So you will be buying 2 iPhones NOW including taxes upfront fees ( $25 sim card charges may apply too) PLUS you are required to add two (2) new voice Lines to your account and T-Mobile will provide you with a $400 Prepaid Master Card LATER in the mail in 8 weeks. And if you cancel any lines during the 24 month period you will be charged the remaining amount due on the iphone(s). FYI: You may have to contact customer service several times to affirm you were eligible to get the promotional iphone deal after 8 weeks if you had not received your $400 Master Card by that time. Yep, this deal/promo pretty lousy. But they have to stay in headlines all the time! Don’t they? free $400 phone by adding a line for which you have no commitment is lousy? can we swap universes? please delete this incorrect comment and all of your other incorrect comments. You only need to add one line and once you get the rebate card you go to the store, pay off your remaining installments and then cancel the line. Right now 2 lines on T-Mobile is $100 1 line is $70. Let’s say 3 months in case the card runs late, that’s $90, and you spent $25 for activation. So when all is said and done you will have a $400 iPhone SE for a total of $115 plus your local taxes on the phone itself… Not a bad deal to me. Yes you are still paying monthly for your new 7 or 6s, but if you were already planning to upgrade then this is a good deal. wow, i did not see it that way… you found the loop hole !!!! Based on T-Mobile’s website, you need to add 2 new lines. Sales reps lose their commission if a line is cancelled within 120 days, so most will tell you that you have to wait at least 4 months to cancel. If you like and want to help the person who helped you out then wait another month before you cancel, but really once you have that card you can leave whenever you want with no penalty. As a side note, while you wait for the card you will be billed monthly for the SE installments, but it will all be reimbursed on the rebate card, so you should still have a small balance to spend as you please afterwards. 1+ lines means one or more lines. The website is correct. Eligible iPhone purchases, qualifying plan, 1+ new lines, and 24-mo. finance agreement for both devices required. THIS IS WHAT IS WRITTEN ON THE T-MOBILE WEBSITE…. it says 1+ new line(s) with an “S” because that means (Plural) more than 1. The entire sentence is joined together which means everything that is written there applies to both phones…. I’m really tempted on this deal. Not sure if I should or wait and see if they do the same thing for the 7Plus. 256GB is a lot of storage. Bu there is no way I will be able to afford the iPhone 8. Unless they have a 7S and 7S Plus. Even so your talking about close to $900. I can afford this price but not the 7 Plus price. Should I wait and see what the next iPhone promotion isor pull the trigger on this? I would but the reason for the 7 plus is the better camera with portrait mode and bigger battery. I heard bad things about the batteries in the 7 and I’m sure it won’t last me all day anyway. Too late, I am finishing off payments for my iPhone 7 and can’t wait for next iPhone or google pixel XL second generation.